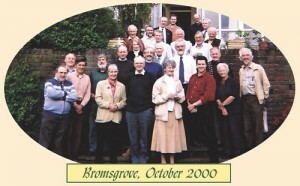 Alistair McConnachie reports: The fourth annual Conference of The Bromsgrove Group was held outside Bromsgrove, near Birmingham, on Tuesday 17th October to Thursday 19th October. This annual two day event brings together in loose association, money reformers, environmentalists, ecologists, academics, and people concerned with a variety of social and religious issues and who are all united in a belief that the supply of money into the economy represents a root cause of their shared concerns. It’s an opportunity to meet, network, discuss issues of vital importance based around reform of the money system, and to develop projects to promote our solutions. The meeting this year was well attended with 36 people attending over the two day period. It began on Tuesday afternoon with attendees arriving from 4pm onwards. After the evening meal, we met in the main living room to share short introductions with each other and to welcome the Right Reverend Bishop of Worcester, Peter Selby, author of Grace and Mortgage — The language of Faith and the Debt of the World, to speak with us. He said that he always received a high level of interest whenever he spoke on the issue of debt and money, and we were encouraged by his presence. The first session of the Wednesday morning, heard Canon Peter Challen put our Conference into context. With the use of his paper An End Game Beyond Stalemate: A Tentative Matrix for Bromsgrove, he highlighted the growing number of diverse thrusts based around the concept of Monetary Reform and provided for us a framework which helped us to guide our thinking throughout the rest of the Conference. After coffee, we heard from James Robertson who spoke about his new book Creating New Money: A monetary reform for the information age. It was considered important that any objections to his proposals — which had been received from official sources — should be documented, in order to provide the Money Reform movement with the appropriate responses to the most common objections and frequently asked questions. Therefore, if you have written to politicians and academics on the matter of this book, then please do send us copies of the replies. We will go through them, list the objections and present the responses in a future article. There was some discussion from the group on the role of one’s local MP. The best place to approach your MP is in his or her constituency surgery. If you try this, be clear on your message and keep it simple! After lunch, we heard from Rodney Shakespeare, author of Binary Economics: The New Paradigm (University Press of America, 1999). Most people were new to the concept of Binary Economics and so Rodney was able to introduce us to its main aspects. He also very kindly brought along a box of his books to distribute free. He circulated and explained his extensive and interesting analysis of the Bromsgrove Statement, showing how he has been able to integrate Binary Economic theory into the Statement. After the break, in a seminar titled “Popularising the Message” we heard from Robert Arnold, Chairman of the British Association of Monetary Reform. It’s important to target the policy makers and opinion formers in society, but it is also essential that we create the demand for change at the grass-roots. In that regard, Robert explained how the BAMR aim to develop grass-roots awareness through simple, easily understood booklets which people can copy, and circulate. To date, the best seller has been Monetary Reform not Monetary Union. A new booklet on the fuel crisis has now been produced and it was suggested that other areas of concern for booklets and informed comment should be the Health Service, Student Debt, Law and Order, and Pensions. It was suggested that we are trying to make people aware of extensive issues which can sometimes be difficult to sum up in short soundbites, but ultimately, it was essential to convey our arguments as briefly and concisely as possible. We were therefore pleased to announce a joint project between Prosperity and the BAMR which will help us to think along these lines. We are planning to produce a car sticker, either for the window or bumper, which will have a short slogan, then the ProsperityUK.com website address and the BAMR phone number. Robert’s talk was followed by Richard Greaves who introduced us to his seminar “Money Talks — but should we believe what it says?”. He has designed it as an interactive presentation which will introduce the subject to people who are totally new to the ideas. He emphasised that he liked to use popular phrases to grab attention such as “debt scam.” It was suggested that there were groups, right across the social spectrum, who were always looking for speakers, and the potential to take the message out in seminar form was enormous. The Organiser of the Conference, Alistair McConnachie, rounded off the afternoon session by explaining the role of Prosperity and the new website ProsperityUK.com He stated that the short-term goal for the newsletter was 500 paid up subscribers by the end of 2002 with a long-term goal of 1000 within 5 years. It was the feeling of the group that this was achievable. He explained that the aim was to communicate, educate, convince and influence. The message has to get out there in order to develop the climate of opinion which will ring in the changes. There was the recognition that everybody at Bromsgrove was doing something constructive to promote the message of Money Reform. After the evening meal we were delighted to welcome Mike Rowbotham, author of The Grip of Death and Goodbye America! It took him four hours to travel over from Norfolk and he had to travel back again that night! We were very grateful for his effort to get to us. He told us that, if possible, he has plans to produce more Money Reform material. Specifically a “Mini-Grip” which would be a shortened version of his very comprehensive work The Grip of Death. He also explained that it was important to have a work which relates Money Reform to the field of environmentalism. In addition, it was essential to have a work which would compare the Money Reform analysis with conventional economic theory in order to engage and educate orthodox economists. The first session of the Thursday morning saw David Pidcock and Ken Palmerton explain their on-going international campaign against debt and interest which they are conducting via their extensive Muslim contacts throughout the world. This was a most instructive seminar. They explained that in Pakistan, the Holy Court, known as the Sharia Court, had ruled that interest was contrary to Islamic law. However, for a judgement to become law, the secular Supreme Court had to rule in favour of the Sharia Court judgement. They told us the amazing news that the Supreme Court has recently ruled in favour of the Sharia Court’s judgement. At the moment, it’s not clear what will happen, but there was a sense that major changes, with massive international implications, could be on the horizon. A book has been published, in English, on this notable event. It summarises the arguments and findings precisely and although it is not yet available in Britain, we will review it and publicise it in Prosperity when it does become available. The final session of the Thursday morning, and of the Conference, was a brainstorming session. There was a recognition that our movement needs money in order to help fund research and educational work. Every movement needs a proper source of finance and the Money Reform field has been bereft for too long. A very constructive proposal was to investigate the possibility, and if feasible, set up, a Foundation which would be a research and educational body which would, for example, be able to help fund necessary projects, co-ordinate research and disseminate knowledge. A resolution to “Investigate the feasibility, and if agreed, set up The Bromsgrove Foundation” was passed unanimously. Any interested readers with experience in setting up a Foundation, please contact the Glasgow address below to help advise. Discussion continued on general fundraising; this was regarded as the essential fuel for our vehicle. Without money there can be no message. Without the message there can be no action. Without the action there can be no change. Suggestions tossed around included “Bromsgrove Bonds”, Raffles, “Sponsor a Page”, passing a hat, and tithing. As the movement increases in size and more people come on board then access to funds becomes easier. Discussion followed on how best to interest and bring aboard other groups. It was important that people sought to unite on the core aspects, and in that regard, the Bromsgrove Statement could be an enabling mechanism which would allow others to come aboard a general movement for economic democracy. A very good suggestion was made to approach other groups with the Statement and ask them to comment and where possible, integrate their own particular areas of economic expertise in the form of a “Supplementary Paper” on the Statement. Much as, for example, Rodney Shakespeare has done with his Binary Economics analysis. It was mentioned that Jubilee 2000 may be looking for a new direction now that its campaign on Third World debt appears to be winding down. It was thought that the direction indicated by the Bromsgrove Statement may interest them. The Conference finished in the early afternoon. About half the people this year were new faces. Comments from attendees included “absolutely excellent”, “intelligent and civilised” and “there’s a feeling that things are moving”. Most of the presentations and discussion were video-taped, and we are presently trying to put together a short video on the proceedings. Thanks to everyone for making it a tremendous two days. And special thanks to our hosts John and Joan Johansen-Berg and their staff for making our stay very pleasant indeed.